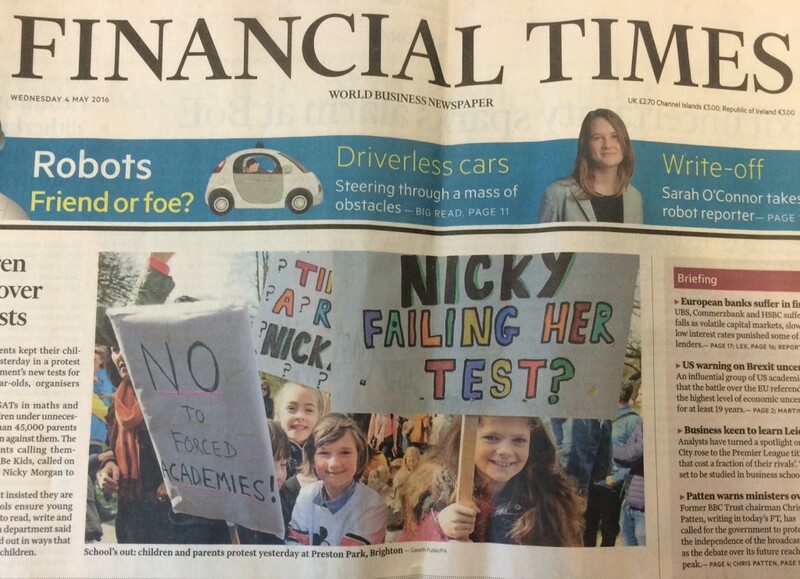 Today the FT’s front page showed the above photograph of children protesting in Brighton about the government’s new tests for 6 and 7 year olds. Those protesting say that SAT’s in Maths and English at such a young age are placing ‘children under unnecessary stress’. The petition to scrap these tests so far has gathered more than 45,000 signatures and has called on Nicky Morgan, the Secretary of Education, to get rid of them. The government say that these tests are necessary to establish that young children are ‘learning to read, write and add up’ and attest that these tests can be ‘carried out in ways that do not put pressure on children’. The campaign’s name is ‘Let Our Kids Be Kids’, as in the title.